east side bride: will I rot in hell for posting this? He looks so happy.... Doesn't he? And I f*cking love that he got married in a flannel shirt. 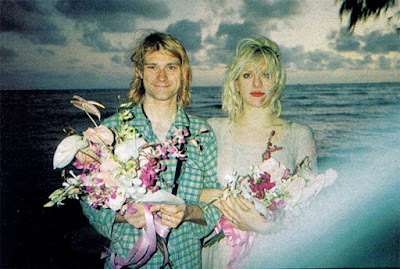 Photo from Kurt Cobain and Courtney Love's February 24, 1992 wedding on Waikiki Beach found here. i saw this picture and my bottom lip stuck right out. like he couldn't get any happier than that exact moment. He looks so happy, and she looks so... not busted. I guess that's what 17 years and a ton of coke will do to you. I got married in jeans a corset...my husband, a suit, sneaks and an "Everybody loves Italians" T-shirt. oh, that is a cool shot even tho he married a frigging lunatic! i like the double bouquet action. I do really like the double bouquet. And somehow it's a nice reminder to enjoy the time we have. Somethings weddings = entitlement in more ways than one. Phew. Ok, Enought with the heavy. @ Naurnie - You're correct. It wasn't a flannel shirt. He actually wore pajamas to his wedding!